Vishakha Dasi offers some very real advice on how to engage your non-vegetarian friends and family, as well as how to keep yourself interested in your karma-free diet. The general idea thought seems to be to learn to cook interesting and exciting meals, offer your food to Krishna, and share it with your friends and family. Everyone benefits! This is one of the three dishes she suggests to try that will excite you about the possibilities in vegetarian cooking. Yamuna Devi herself fine tuned this recipe many years ago from a traditional Indian dish called Ananas-Matter Ras. Although it takes only about 15 minutes to prepare, please budget about 30 minutes for it to cook as well. 1. Combine 1/2 of the nuts, the sesame seeds, coriander seeds, and dried coconut in an electric coffee mill and pulverize to a fine powder; transfer to a small dish. Place 1/4 cup of water or coconut milk in an electric blender jar, add the minced ginger and chilis, cover, and blend on high speed until smooth. Remove the feeder cap, and by spoonfuls, feed in the pulverized powdered nut mixture. If necessary, add water to facilitate blending the mixture into a smooth, thick puree. 2. Heat the clarified butter or oil in a 3-quart saucepan over a medium flame for 1 1/2 minutes. Add the remaining cashews and almonds and stir-fry until the nuts are golden brown; remove them with a slotted spoon and set aside. Raise the flame to medium high, drop in the black mustard seeds, and fry until they crackle and sputter; add the smooth, wet nut puree and a sprinkle of water and stir-fry for 1 1/2 to 2 minutes. Add the remaining 1 1/3 cups of water, the saffron threads, and the salt. Cover and gently boil for about 5 minutes. 3. Add the pineapple and peas. Reduce the flame to medium-low. 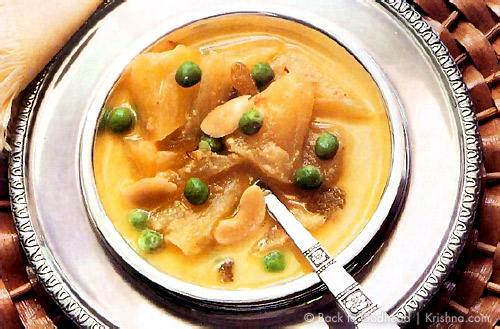 Cover and simmer for 20-25 minutes or until the pineapple and peas are tender. Remove the pan from the flame, stir in the cream, nutmeg powder, and garam masala; sprinkle the remaining fried nuts over the surface as a garnish, and offer to Krishna. That must be very delicious. Submitted by Anonymous on Wed, 12/05/2012 - 19:18. Submitted by Anonymous on Mon, 08/06/2012 - 12:28.